If you read my post about my first visit to Sullivan St Bakery, you may be wondering why I went back. Didn’t I vow never to return? The answer is very simple and (to me) surprising: they invited me. In a nutshell: I visited Sullivan St Bakery in January, and after making my purchase I brought out my camera and began to photograph some of their products. At that point I was berated by one of the people behind the counter. I wrote about my experience on this blog and figured that was the end of it. However, about a week after I wrote the post I got an email from Jim Lahey’s assistant, Anatte, inviting me back for a tour and to meet Jim and taste some of their products. I wasn’t sure exactly what to expect from the meeting; I thought at most I would get a quick look around, a handshake with Jim Lahey, and an offer of free food (I planned to deny this offer, not wanting to appear to be “bought off”). I was by turns embarrassed, flattered, and apprehensive about the tour. Waiting for Anatte I had the opportunity to observe the goings-on in the front of the store, and I noticed that the customers were always made to feel welcome and appreciated. I wondered what had gone wrong on my first visit. My musing were interrupted by a group of people descending the stairs just behind and to the right of the register. Much to my surprise, Lahey himself greeted me from behind the counter with a mock stern voice: “What are you doing here! Why did you bring a camera? !” Then he broke into a smile and offered his hand to me. Then he invited me behind the counter and into the back and immediately began asking me friendly questions about my blog and my interest in food. Still a little star struck, I managed to ask how they even came across my blog in the first place, seeing as how we don’t have very many readers. It turns out that they have a PR team that keeps an eye out for this kind of thing, and they were concerned with what I had experienced in January. As we began the tour, Lahey explained that he had spent the last month or so absorbed in the opening of his pizzeria, Co., and as he talked he seemed to relish re-familiarizing himself with the bakery. He noticed little changes, and told me that he likes things to change, to evolve, that it’s no good when everything stays the same. He went out of his way to say hello to all of the employees we encountered, and to say something nice to each of them about the work they were doing. He knew the names of everyone we encountered, from bakers in the back to the cashier at the front of the store. Another observation: his mind seemed to be working about a million miles an hour; he peppered his tour with random questions about me, seemingly out of nowhere — “Where are you from, originally?” “Are you into independent music?” “Is that a Canon Rebel?” — before launching back into the tour. No one, I believe now, has more knowledge about both the history and the science of making bread than Jim Lahey. From Greek bread cults and their influence on Christianity to the myriad names of a dozen strains of yeast, to the differences in the way yeast acts during the winter versus the summer (including the rate at which it propagates), to the invention of commercial baker’s yeast and its relation to the shelf life of supermarket bread, and much, much more. The information came pouring out of him. Learned over a career of baking from trial and error as well as extensive reading (he recommended Six Thousand Years of Bread: It’s Holy & Unholy History to me), all of it influences and informs his own career. Lahey seems to be completely and utterly obsessed with bread and baking. So much the better for us. First he showed me the big tubs of dough, all labeled with the date and time they were made and with what product they were destined to become. He opened up several of the tubs to show me the difference between the newer batches, which were just rising, and the older batches, nearly doubled in size. Next we entered a walk-in cooler, where there were two tubs of natural starters. We tasted one of them — a starter he’s been cultivating for about 15 years. It was intense and yogurt-like in both taste and texture. 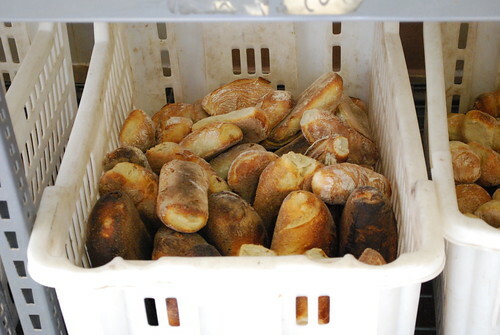 The bakers add some of the starter along with some commercial yeast (for reliability and consistency) to almost every batch of bread they make. There was a worker busy cutting precise squares for an unnamed baked good (one of the changes Lahey pointed out to me was a chart posted for employees showing the finished sizes of various breads) We walked past the ovens, and Lahey showed me a long pizza bianca that was cooling (one of the only kneaded bread products he sells and, according to him, one of the oldest known bread products in history). At this point in the tour Lahey began getting reminders about another meeting he had in a few minutes, and he became a bit distracted (I got the impression that this happens pretty regularly; his distraction, I mean). I did manage to get a glimpse of their distribution room, filled with bins of bread destined for shops and restaurants all over NYC. Soon after this Lahey was whisked away and Anatte led me back out front for some free stuff. I declined the offer at first, but Anatte told me that Lahey would insist. Truth be told, after being around the bakery for a while I was getting a bit hungry… I took home a piece of the pizza bianca (very good, crispy and chewy), a piece of banana bread pudding (a little disappointing), and a vanilla cream-filled bomboloni (“We’re kind of known for them,” Anatte told me, and it was very good). She also told me about a relatively new product they are excited about, a bread called pane de comune (bread of the people) which is a machine-made bread with whole wheat flour. I didn’t try this, but it looked nice and dark and crusty. I came away from the experience convinced of Jim Lahey’s generosity, and his genuine enthusiasm for his work. I can honestly say that I don’t think my first experience at Sullivan St Bakery was representative of what Lahey expects of his operation. I truly appreciate Jim Lahey, Anatte, and all of the other people I met at the bakery taking the time to make me feel welcome. If nothing else, it was an object lesson for me as a food blogger that there are real people behind the food we eat. Some of them, it seems, really cherish what they do, and are willing to show the world how much they care.